Despite a late run by Valhalla, the Steele Canyon Cougars were able to claim the victory behind a 17 hit attack and the offense doing the damage early. Scoring in the top of the first started for the Cougars as Maggie Carpenter (2-3, 2R, RBI, 2B) singled to score Audrey Bagge (4-5, R) and advanced JJ Venzor (3-4, 3R, 3 RBI, 2B, 3B) to second, she came into score on a Bianca Morales (2-3, R, RBI) hit to make it 2-0. Steele added to their lead as Amanda Whipple (2-3, 2 RBI) laced a single to score Carpenter which made it 3-0 and Carly Logan (2-3, RBI, 2B) roped a double which scored Morales to round out the scoring. 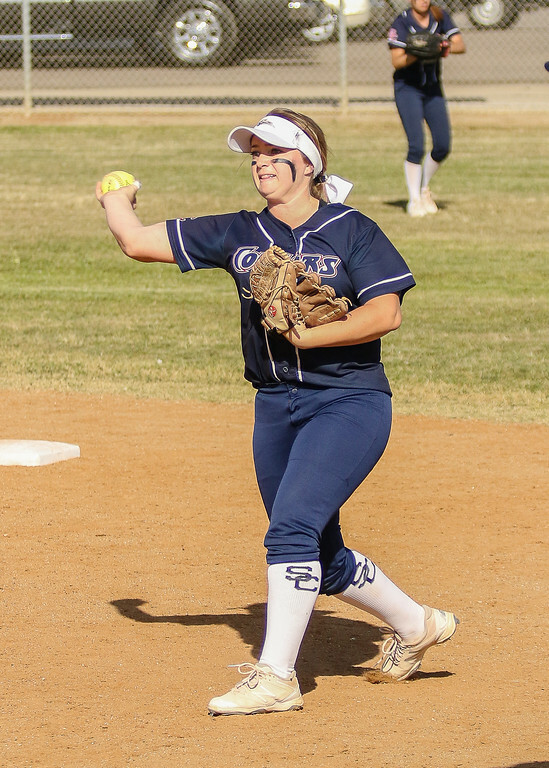 The Cougars added two more runs in the top of the second inning thanks to hits by Whipple and Marley Rimoldi (1-3, RBI) to give Steele Canyon a 6-0 lead. They added another run on a double by Venzor in the top of the third which allowed Masen Pearlstein to score. Valhalla finally was able to put up a threat in the bottom of the fourth inning as Kennedy Labshere (2-4, RBI) led off with a single and Samantha Green (1-4) singled which advanced Labshere to third. However, Grace Richter was able to retire the next three batters to squelch the threat and end the inning. For the Cougars in the top of the fifth Venzor would do all the damage as she tripled which brought home Tayler Thomas which was followed by her stealing home to make it 9-0. Leading 10-0 things looked pretty good for the Cougars as they had put down the Norsemen all day long. However Valhalla in the bottom of the seventh took advantage of some opportunities starting with Delaney Stettler (1-2) drawing a one out walk, Aubrey Baker (RUN) into run, Frankie McGuire (RUN) followed with another walk, a couple batters later with two outs Bailey Munch (1-1, R) singled advancing Baker and McGuire up to load the bases, Jade Hill followed with a two run double which scored Baker and McGuire, Rachel Shellstrom (RUN) reached on an error which scored both Munch and Hill to make it 10-4, Labshere singled which scored Shellstrom on the throw to round out the scoring as Richter retired Green to end the contest. On the day for the Cougars, Richter tossed a complete 7 innings to gain the victory while giving up 5 runs of which 2 were earned on 6 hits while walking 1 and striking out 4. In the loss for the Norsemen, Lexi Schmehr only lasted 1 1/3 innings giving up 6 runs which were all earned on 6 hits and walked 3. Coming into to relieve was Stettler who went 5 2/3 innings giving up 4 runs which were all earned on 11 hits.